In honor of this week’s meeting of the Association of Asian American Studies, we present a roundup of some of the wonderful new Asian American studies and literature titles we’ve published in the past year. If you’re headed to the conference, stop by our booth to check out these new books; meet UW Press Editor in Chief Larin McLaughlin and Senior Acquisitions Editor Ranjit Arab; and learn about new UW Press series such as Decolonizing Feminisms: Antiracist and Transnational Praxis. Also, attention first-time authors! On Friday, April 24 from 4:45 to 6:16 p.m., Senior Editor Ranjit Arab will participate in the session titled, “Roundtable on the Nuts and Bolts of Publishing.” Join him and editors from other presses as they explain the steps of publishing your book with a university press and address frequent questions and concerns they hear from authors. From labor and anticolonial activists around World War I and multiracial campaigns by anarchists and communists in the 1930s to the policing of race and sexuality after World War II and transpacific movements against the Vietnam War, The Rising Tide of Color brings to light histories of race, state violence, and radical movements that continue to shape our world in the twenty-first century. “This brilliant volume is incisive, intellectually generative, and analytically rigorous. The Rising Tide of Color reframes our understanding of race and social movements by centering on the Pacific Coast.” –Diane Fujino, author of Samurai among Panthers: Richard Aoki on Race, Resistance, and a Paradoxical Life. Drawing on critical theories on space from urban geography, ecocriticism, and postcolonial studies, Zhou shows how spatial organization shapes identity in the works of Sui Sin Far, Bienvenido Santos, Meena Alexander, Frank Chin, Chang-rae Lee, Karen Tei Yamashita, and others. She also shows how the everyday practices of Asian American communities challenge racial segregation, reshape urban spaces, and redefine the identity of the American city. The first edition of No-No Boy since 1979 presents this important work to new generations of readers. “No-No Boy has the honor of being the very first Japanese American novel,” writes novelist Ruth Ozeki in her new foreword to John Okada’s classic of Asian American literature. First published in 1956, No-No Boy was virtually ignored by a public eager to put World War II and the Japanese internment behind them. 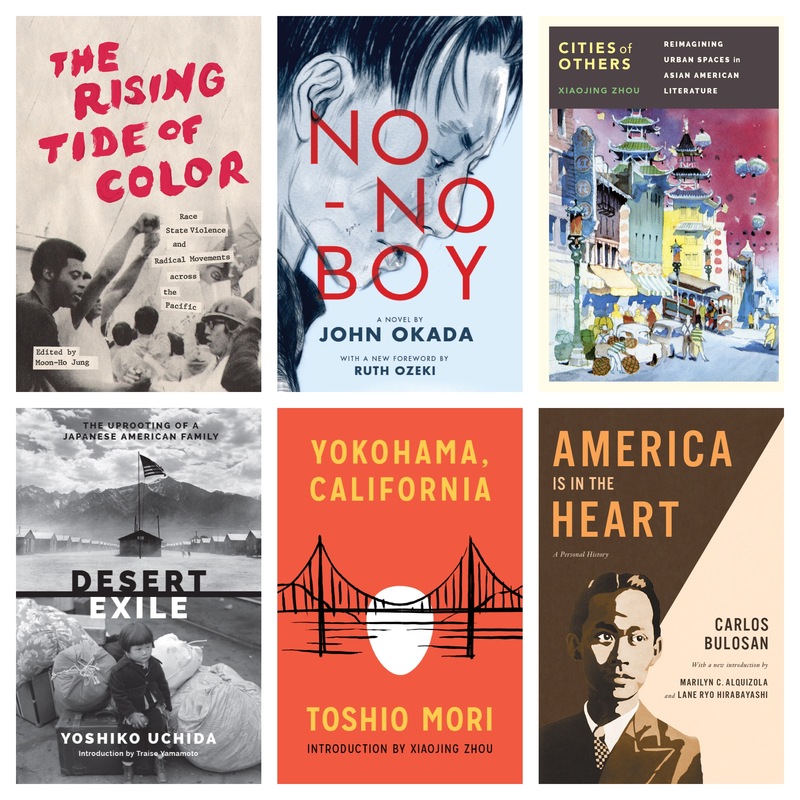 It was not until the mid-1970s that a new generation of Japanese American writers and scholars recognized the novel’s importance and popularized it as one of literature’s most powerful testaments to the Asian American experience. Yokohama, California, originally released in 1949, is the first published collection of short stories by a Japanese American. Set in a fictional community on the West Coast, these linked stories are alive with the people, gossip, humor, and legends of Japanese America in the 1930s and 1940s. After the attack on Pearl Harbor, everything changed for Yoshiko Uchida. Desert Exile is her autobiographical account of life before and during World War II. The book does more than relate the day-to-day experience of living in stalls at the Tanforan Racetrack, the assembly center just south of San Francisco, and in the Topaz, Utah, internment camp. It tells the story of the courage and strength displayed by those who were interned. This entry was posted in Asian American Studies, Conference Preview on April 22, 2015 by uwpressblog.